I wrote about my first day at the culinary school here a few months ago. By the fifth month at the school, me and my fellow wanna-be-chefs had gotten used to the routine of waking up early and dressing up in all whites every day. Our brand new knife bags and crisp recipe books were stained with sauces, and in some cases, with our own blood. Band-aids were to be found in our pockets and on our fingers. Most of us had also started working outside the school to get more practical experience. We were allowed zero creativity at these restaurants and working 8 to 10 hours outside of the school was the new normal. While the TV shows might have you believe that the kitchen is a place where chefs freely talk to their crew and discuss their ideas openly, in reality, there were whole 8 hours shifts when the only thing I got to say was “Yes, Chef”! Our 15 minute late afternoon linner (lunch and dinner) break involved reconnecting with the outside world through our smartphones, and shoving down as much food as we could. The beer at the end of the night shift was the shining beacon that gave me the strength to survive the ordeal of a busy dinner service. We had all made our peace with the whole routine. The excitement of the early days was replaced by the thoughts of somehow surviving through the course. We were just happy that at least at school we were allowed some creativity in our work. Little did we know that we were in for a surprise – it was time to start baking. Our instructor had made it crystal clear that we were to leave our creativity and judgement at home. Baking was all about formulas, precision and accuracy. The full pantry we had access to in the lunch preparation was replaced by six basic building blocks of baking – flour, sugar, eggs, milk, butter and flavoring. We started learning how applying heat to a different combination of these six building blocks could create a different outcome, from buttery brioche bread to fluffy croissants. While my alpha-male classmates were the stars of the hectic lunch preparation, suddenly the calm and quiet types were getting all the praise from our instructors in the baking class! If you buy your baked goods at a super market, you might be surprised how much butter and lard goes into making those treats! I highly recommend you bake your own favorites at home where you can choose the ingredients and make substitutions. I have created gluten-free strawberry cupcakes today using fresh strawberries, almond meal and ghee. 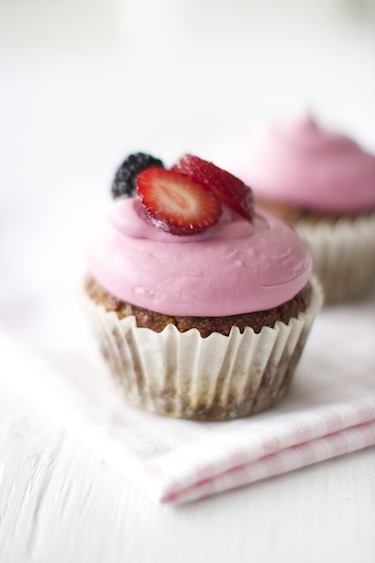 The frosting on the cupcake is made of fresh strawberry purée, coconut milk and honey. No butter, no lard, no refined sugar. So put on your apron, put on that meditation CD that you haven’t used in months, and lets get baking! Preheat oven to 350°F. Line the muffin pan with paper liners. In a large bowl mix almond flour, salt and baking powder. In another bowl whisk together eggs, honey and ghee. Pour wet ingredients into dry ingredients and mix well. 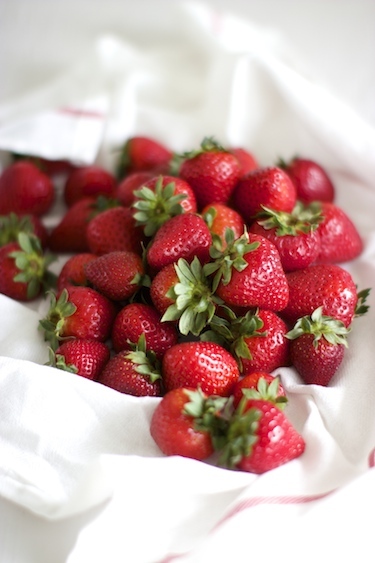 Add chopped strawberries and fold gently until combined. Divide the batter in muffin cups. Smooth out the top to the cups with wet spoon. Bake for 30-35 minutes, until muffins are golden brown and toothpick comes out clean. Let them cool on wire rack. Put strawberries in a blender and make a smooth purée. Pass the purée through strainer or cheesecloth. Set it aside. 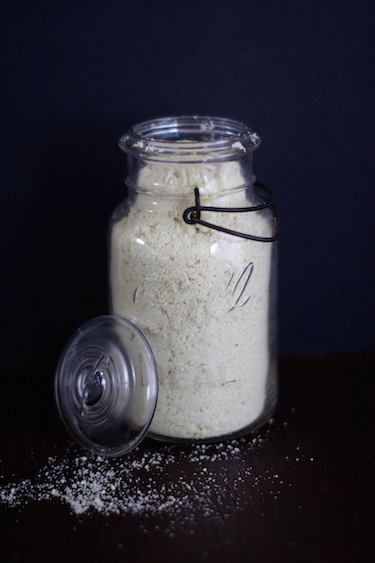 Refrigerate coconut milk cans for at least 4 hours or overnight to separate coconut cream from water. Open the can and carefully scoop out coconut cream solids from the top. Add honey and cardamom powder, whip the cream by hand until fluffy. 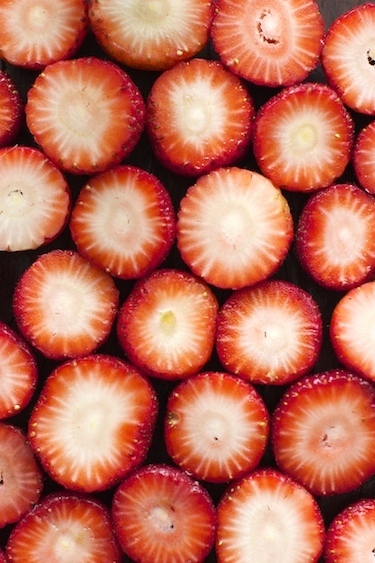 Now add strawberry puree, 2 tbsp at a time, until you get desired color. 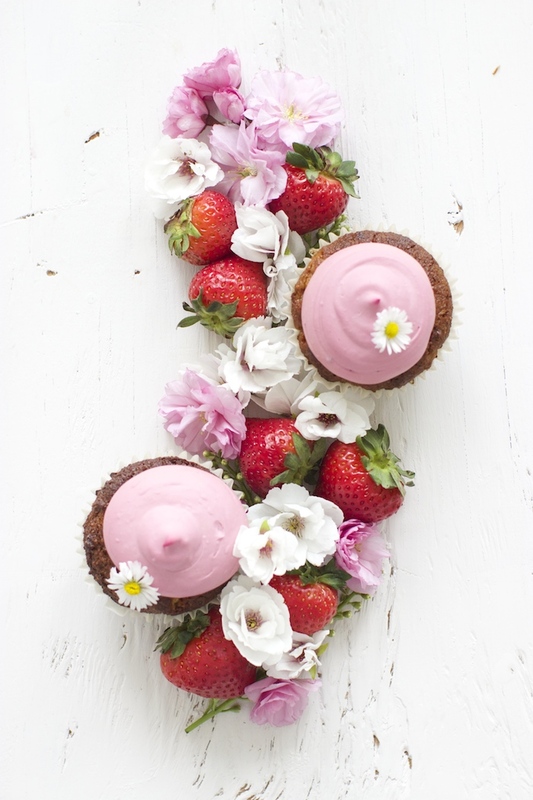 Put the whipped coconut cream in the piping bag and decorate your cupcakes. Have fun with it! Everything is so beautiful here. awesome recipe, awesome photography. your creativity is much appreciated. Your blog is getting better with your every post. I wonder how can some one put it perfectly every time love everything about your blog, love those cherry blossoms. Thanks Deepa! If you are looking for a cake recipe instead of cupcakes, you might like http://www.farmonplate.com/2013/11/07/birthday-cake-almond-cake/. Cheers! These sound amazing – love the frosting on these! First time here. 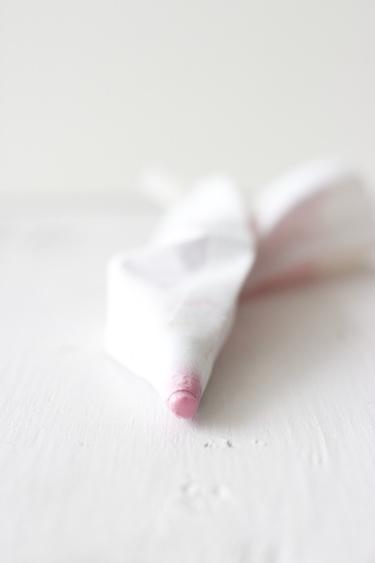 Lovely blog and love the images. this is just so lovely. i’ve been eagerly waiting for proper strawberry season, which usually starts when our local farm opens for harvesting of these precious fruits. we have another month or so to go! one of my fave combos is strawberries + coconut milk. These look delicious. I can’t eat eggs though – what substitute would you recommend? You can substitute eggs with ripe banana or chia seeds. I have not tried this substitution for this recipe, so texture and taste of the muffins will be different from what I had! 1/4 cup pureed banana for 1 egg. Grind your chia seeds into meal. Mix the 1 tbsp ground chia seeds with 3 tbsp water for 1 egg. Allow to sit for 10 minutes or so, or until it takes on a gooey texture. So lovely!! Hey, do you think for the frosting I could use cashew cream in replacement of coconut cream (which is quite expensive here). Would love to try this one day! Absolutely! I love cashew cream on my baked goodies. If you are looking for a cashew cream recipe, you can check out this post http://www.farmonplate.com/2013/11/07/birthday-cake-almond-cake/. Cheers! These are so beautiful and I LOVE the coconut cream frosting! I will have to use that on my next batch of cupcakes It looks like it would be good eaten with a spoon too! Thanks Isadora for stopping by! You are spot on – I was guilty of eating more of this frosting with a spoon, than I actually put on cupcakes! It was thick and creamy with a hint of coconut and strawberry flavors! Beautifully captured and nicely explained too. I wish of lifting those cupcakes straight from the pictures. 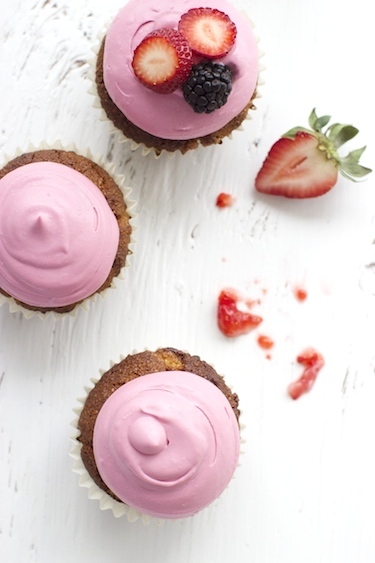 Medha, your strawberry cupcakes are so beautiful and I bet they taste spectacular! 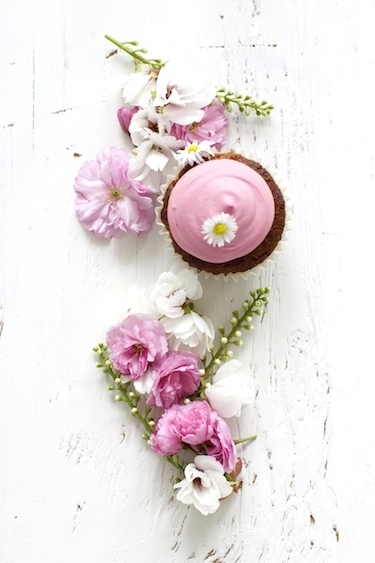 I love the pink coconut frosting and pretty cherry blossoms too – Great photography! Coconut cream frosting is one my favorite frosting and my clients love them a lot . Your write up and pictures are amazing ! Love your photos, as always 😉 I’ve never tried gluten free cupcakes. This will be the first! Thanks for sharing such beautiful and healthy recipe! Beautiful photos! 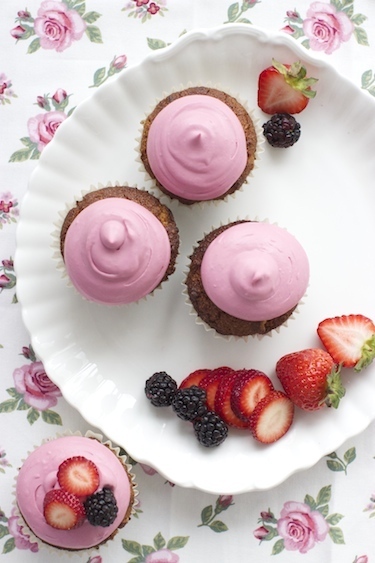 These cupcakes look yummy – will definitely have to try! Thanks Eva, you have a beautiful blog as well!